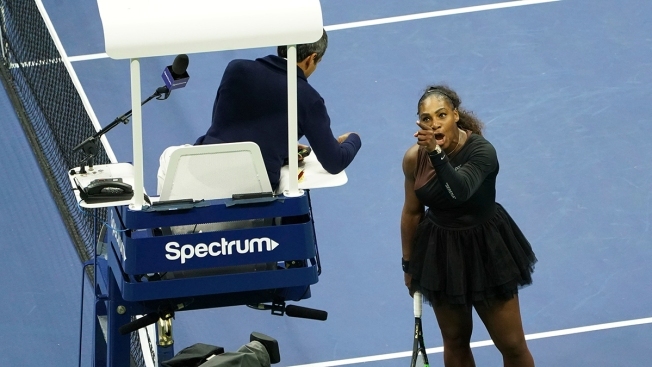 Serena Williams argues with chair umpire during a match against Naomi Osaka, of Japan, during the women's finals of the U.S. Open tennis tournament at the USTA Billie Jean King National Tennis Center on Saturday, Sept. 8, 2018, in New York. Serena Williams was fined a total of $17,000 for three code violations during her controversial loss to Naomi Osaka in the U.S. Open final. The money comes out of her prize money of $1.85 million as the runner-up to Osaka, whose 6-2, 6-4 victory on Saturday made her the first tennis player from Japan to win a Grand Slam singles title. The Women's Tennis Association called for equal treatment of all tennis players and coaching to be allowed across the sport in the aftermath of the scandal. On Sunday, Osaka tweeted, "So there’s been a lot going on but I just want to say, I was grateful to have the opportunity to play on that stage yesterday. Thank you." She said Monday on the "Today" show she hadn't had time to fully look into what happened, so she hadn't formed an opinion.